If you have been following my blog since I started years ago. You'd know that I initially was doing a relaxed-hair healthy hair journey. 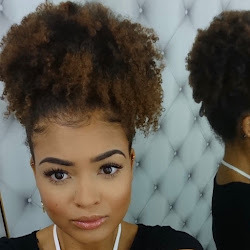 At this stage I loved going to the afro hair care store and testing new products. One of the products I tested and reviewed on my blog (read here) were the Curls Coconut Sublime Conditioner, Curls Curl Souffle and the Curlicious Curls- Cleansing Cream. These were all amazing and smelled like a mix of Coconut and Caramel. For the time it was, I found them to be very innovative with products like the cleansing cream, years before the Co-wash trend kicked off and brands started to realise. Now onto the new products. 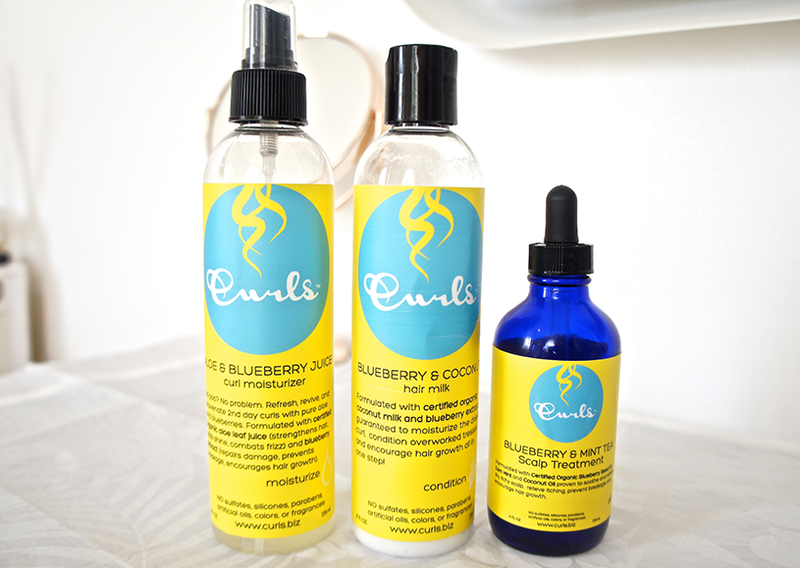 They are all new additions to the Curls Blueberry Bliss Curl Collection and consist of a spray hair moisturiser, moisturising milk and scalp oil. All of them have the same scent which I supposed is supposed to be a "blueberry scent"- I love the scent personally but I think they more so smell of sweets or sort of fruity! In my review below, please find direct links to the products within each product title. Here you can view the full ingredient lists. Description:"Refresh, revive, and rejuvenate 2nd day curls with pure aloe and blueberries. 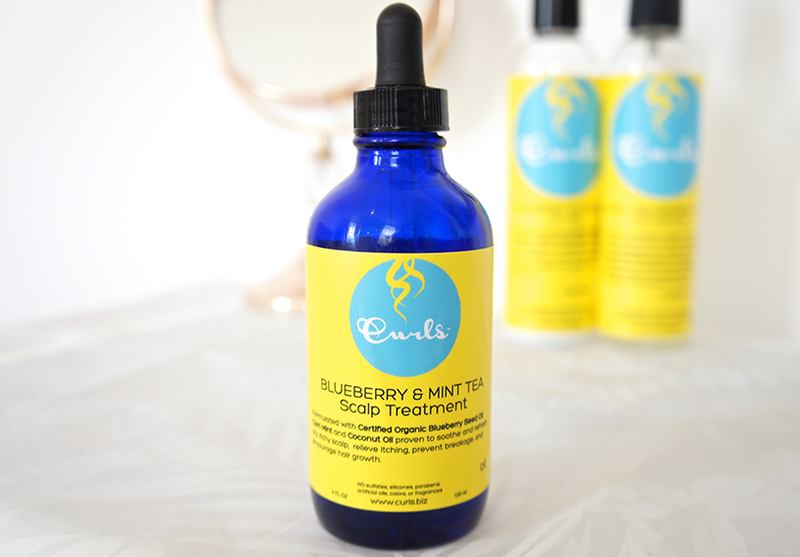 Formulated with certified organic aloe leaf juice (strengthens hair, adds shine, combats frizz) and blueberry extract (repairs damage, prevents breakage, encourages hair growth). NO sulfates, silicones, parabens, artificial oils, or fragrances." 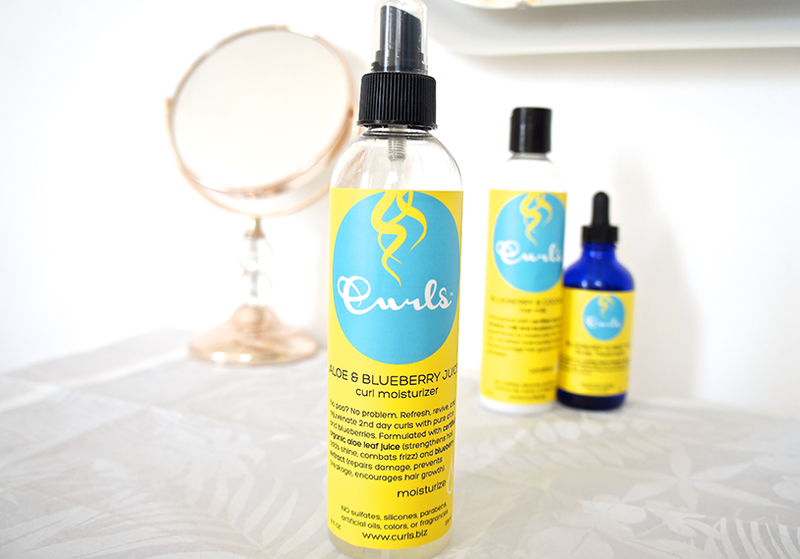 First off is the Aloe and Blueberry Juice Curl Moisturizer which comes in a spray bottle. In addition to moisturising and refreshing your hair I find it to be a good detangler. I currently only wash my hair bi-weekly, so I've used these products as a weekly refresher. I used this spray to re-wet and re-moisturise as well as to detangle it. The ingredient list doesn't disappoint with the second ingredient after water being Aloe Vera Leaf Juice followed by Glycerin. Description: "Blueberry & Coconut Hair Milk, formulated with certified organic coconut milk and blueberry extract guaranteed to moisturize the driest curl, condition overworked tresses and encourage hair growth all in one step! NO sulfates, silicones, parabens, artificial oils, or fragrances." The second product I tried out was the The Blueberry and Coconut Hair Milk. Just like the other products, it smells like sweets and I used it as the next step after the Aloe and Blueberry Juice Curl Moisturizer. It is very moisturising but quite light weight. If you have looser curls, these two products might be good for using just after washing your hair. I personally would use products like this to re-moisturise my hair as I need a thicker/creamier product straight after washing my hair. Description: "Formulated with certified organic blueberry seed oil, corn mint and coconut oil proven to enhance hair growth, soothe and refresh dry, itchy scalp, and relieve itching. NO sulfates, silicones, parabens, artificial oils, or fragrances." Last but not least, the Blueberry and Mint Tea Scalp Treatment. The oil comes in a dark glass bottle, which is the best way to store oils as it prevents them from oxidising. Inside there is a actually a dropper, something I haven't seen before for a hair oil. But when using it, it was actually very useful as it's very long and reaches your scalp easily. The only problem with the dropper is that it can spill quite a bit, which is a little bit annoying. Not everyone uses scalp oils but I am personally an avid user of them as I want to prevent scalp dryness and flakiness after shampooing and I always put peppermint oil in my oils mixes to give that tingling/soothing feeling (check out my blog posts on DIY oil mix here). I have tried quite a few scalp oils to review in the past and this is the first one that has actually replaced my home made mix. It is super light, smells of fruits mixed with mint, it gives the tingling feeling that I love as it contains Menthol (a constituent in Peppermint essential oil). 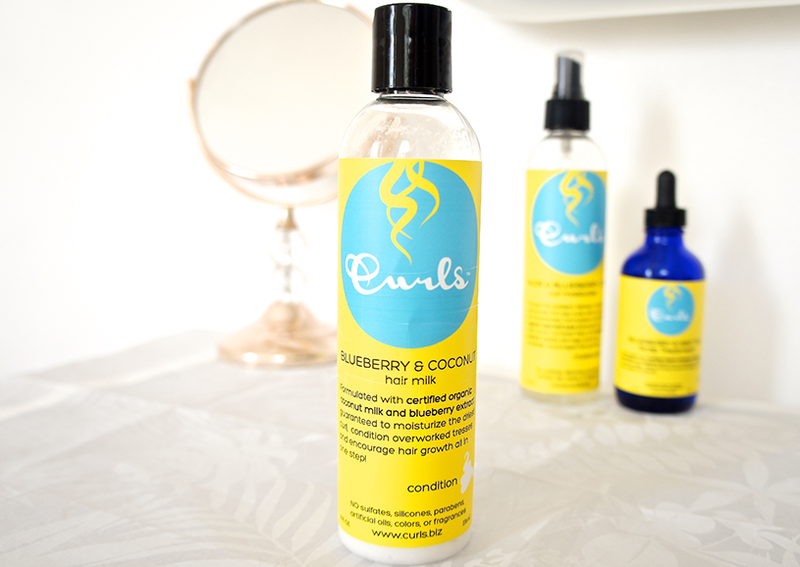 The products are available to buy at www.curls.biz and I have linked each product in the title if you want to have a look and see the full ingredient lists. Overall I really enjoyed using this range. I am so impressed by the scalp oil- I actually haven't used my own scalp oil mix since I got it. The products all smell yummy and worked really well to re-moisturise my hair. As I mentioned previously, I would recommend these as main moisturisers for looser curls or as a refresher-re-moisturiser for tighter curl types like my own. Have you tried this range, or the Curls brand in general? Thanks for taking the time to comment, making me super happy! I reply to every single comment, but it might take a couple of days.